Ranked as the country with the highest return on investment in the Gulf Cooperation Council (GCC) region and as the expats’ favorite choice to live and work in, Bahrain has been continuously working to boost its real estate investment potential and overcome the restriction its geographical nature (i.e. its small area) has forced on it. This has been done mainly through the creation of multiple artificial islands off the kingdom’s mainland to create more lucrative luxurious spaces for living and investments. Reef Island comes as one of the most prominent of these islands. A $1.2bn artificial island situated on the northern coast of Manama, the capital city of Bahrain, Reef Island spans 7 hectares of land (579,000 square meters) where 3,000 people currently reside. It is a joint venture between both the public sector (i.e. the Bahraini government) and the private sector (i.e. Lulu Tourism company) of the Kingdom of Bahrain. Why is Reef Island one of the most expensive destinations in Bahrain? Being a few minutes away from the heart of the major commercial hub that Manama city is, Reef Island’s strategic location offers its residents and visitors an instant access to the bustling city life on one hand while granting them the ability to enjoy the captivating tranquility of its beaches and mesmerizing water view. This mixture has made the island a perfect spot to both live and invest in. Aiming at meeting all the different potential needs of its clientele, investors and visitors, Reef Island comprises different types of residential units. The units do not only vary between villas (65), chalets (49) and residential buildings that include more than 1200 apartments, but they also enjoy the irresistible sea view as they all overlook private lagoons. Because of that, it is almost always guaranteed that you will find the property that fits your needs and wants in Reef Island. Reef Island is only a few minutes away from the heart of Manama, Bahrain’s capital city. However, even within the island you can probably find everything you might need due to the many facilities and destinations it houses. 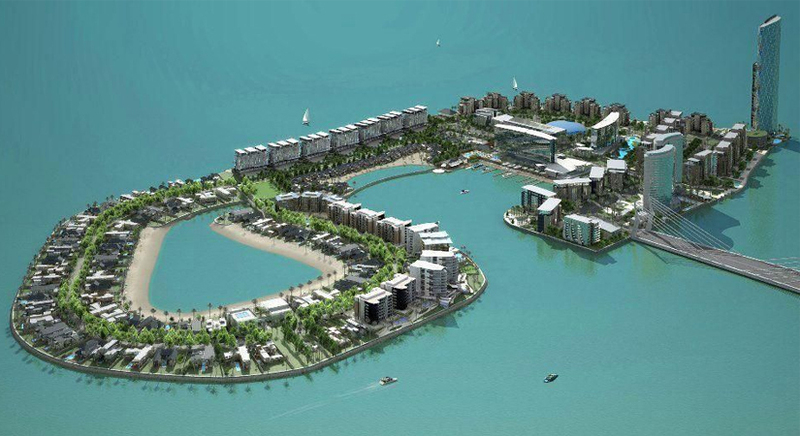 Last but not least, Reef Island has the edge of being one of Bahrain’s freehold areas. These are the areas where non-Bahraini citizens are allowed to own properties. This makes it an even more lucrative investment and a striking attraction for the expats and foreign investors. However prosperous the residential market of Reef Island might be, it did not contradict the strong presence of the hotels and hospitality industry. The island offers its visitors a unique experience in its eponymous five star hotel that comprises luxurious rooms with an average area of 50 square meters, as well as serviced hotel apartments. In addition to the offered accommodation options, the hotel houses multiple high-end amenities and entertainment facilities including world-class restaurants, a gym, and shops. Also, the hotel includes a private marina and yacht club. If wellness tourism is what you are seeking, then Reef Island would still be the right place for you. The island houses a world-class medical center that provides its visitors with medical and healthcare services that meet the highest quality standards and utilize the most advanced medical technologies, equipment and techniques operated by high caliber doctors and specialists. We all can use a little refreshing stroll with the ones we care about on our day off or even after a long exhaustive day at work. For that purpose, Reef Island houses a long promenade with a stunning sea view and lively green spaces that is perfect for relaxing good walks where you can get some good fresh air and a sense of needed tranquility. All these features and inclusions makes both living and investing in Reef Island an opportunity you would not want to miss; so now to the more important question, how much does it cost to purchase or rent a property there? Reef Island is considered one of the most luxurious high-end areas in the Kingdom of Bahrain, and for that, the property prices there are among the highest property prices in the island kingdom. For example, you can purchase a luxurious fully furnished two-bedroom apartment in Reef Island with three bathrooms that offers a mesmerizing sea view for 145,000 BHD and comes along with tower amenities that include a swimming pool, a sauna room and a steam bath. If you are brining your own furniture with you, you can invest in a semi-furnished two-bedroom apartment there for 130,000 BHD. If you are looking for a new place for your family, however, you might need a bigger space; in which case, a fully furnished three-bedroom apartment with four bathrooms in Reef featuring a sea view and a city view can be purchased for 175,000 BHD. On the other hand, if you would like to rent a fully-furnished two-bedroom flat in Reef Island, rentals for two-bedroom apartments start from 700 BHD and can reach up to 1000 BHD. However, if you are looking for a more spacious furnished three-bedroom apartment, rental prices start from 1,100 BHD. Although Reef Island is probably the most expensive area to live in within the Kingdom of Bahrain, the island’s features certainly pay off. It is also one of the most searched areas in Bahrain, and it is expecting to gain more prominence in the upcoming years.